RICHLAND, Wash. — Strong monsoons in the Indian Ocean can induce easterly winds that push Atlantic Ocean hurricanes westward, increasing the likelihood they'll make landfall in the Americas, according to new research. A new study finds that in years where summer rainstorms in India are stronger, Atlantic hurricanes move further westward towards land. In years where the rains aren't as strong, hurricanes tend to curve northward earlier and fizzle out in the north Atlantic Ocean. This newly-discovered relationship could help scientists better predict the path of oncoming hurricanes, especially in late summer months like September, when Atlantic hurricane activity peaks, according to the study's authors. "What amazes me is how rainfall near India can drive important changes to Atlantic hurricanes half a world away," said Patrick Kelly, an atmospheric researcher at the Department of Energy's Pacific Northwest National Laboratory in Richland, Washington and lead author of the new study in Geophysical Research Letters, a journal of the American Geophysical Union. "This research is the first to draw the connection between Atlantic hurricanes and the Indian monsoon." The Indian monsoon season has typically waned by September, but climate projections suggest that under future warming conditions, monsoon precipitation will increase, and the monsoon season could end later in the year. As the climate continues to warm, the monsoon could have an increasing influence on the paths of Atlantic hurricanes, according to the new study. "Forecasting for landfall of hurricanes on seasonal timescales is something we just haven't typically done," said Benjamin Kirtman, a professor of meteorology at the University of Miami who was not involved in the new research. "The thing that is profoundly exciting about this work is its potential to improve seasonal forecasting and predict landfalling hurricanes." Previous research has attributed changes in hurricane steering to El Niño-Southern Oscillation (ENSO), a periodic fluctuation in sea surface temperature and air pressure in the equatorial Pacific Ocean. Scientists have traditionally relied on the La Niña cool phase of ENSO to make predictions about how strong a particular Atlantic hurricane season will be, but have trouble forecasting the paths of individual hurricanes. "In seasonal forecasting of hurricanes, our biggest predictor of what's going to happen has typically been La Niña," Kirtman said. "Unfortunately, seasonal forecasting based on La Niña hasn't been able to tell us much about landfall." In the new study, Kelly and his colleagues wanted to find out how the Indian monsoon, a known source of climate variability, affected hurricane tracks, since the Indian monsoon had not yet been investigated in the context of Atlantic hurricanes. They conducted simulations of hurricane tracks with a model that incorporates observed variations of monsoon intensity and found that in response to strong monsoons, hurricanes shifted significantly westward. 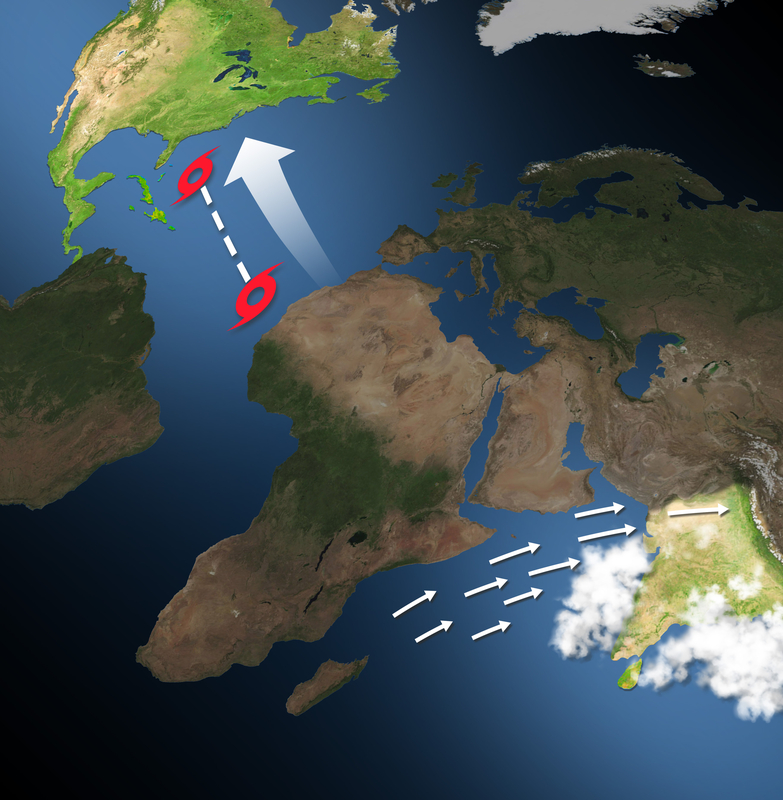 Strong monsoons influence hurricane steering by enhancing the effects of the North Atlantic subtropical high, a center of high atmospheric pressure in the Atlantic Ocean. When the subtropical high increases, stronger winds come from the east and push hurricanes westward. It's important to account for the correlation when studying hurricane steering and landfall probability. "This work untangles La Niña's role on frequency, whether there are more or less hurricanes, from the steering impacts of winds, governed by the Indian monsoon," Kelly said. "La Niña events often happen during a strong monsoon, and they are correlated, but this work helps separate the independent influence of those two phenomena."